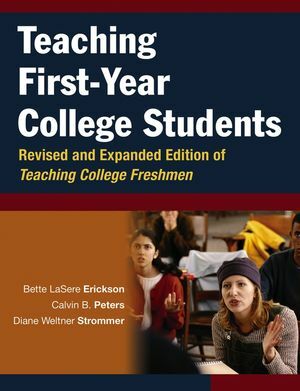 Teaching First-Year College Students is a thoroughly expanded and updated edition of Teaching College Freshmen, which has become a classic in the field since it was published in 1991. The book offers concrete suggestions about specific strategies and approaches for faculty who teach first-year courses. The new edition is based on the most current research on teaching and learning and incorporates information about the demographic changes that have occurred in student populations since the first edition was published. The updated strategies are designed to help first-year students adjust effectively to both the academic and nonacademic pressures of college. The authors also help faculty understand first-year students and show how their experiences in high school have prepared¾or not prepared¾them for the world of higher education. Bette LaSere Erickson is director of the Instructional Development Program at the University of Rhode Island. She was a founding member and former executive director of the Professional and Organizational Development (POD) Network. Calvin B. Peters is professor of sociology and anthropology at the University of Rhode Island. He was co-principal investigator of the university's Multicultural Center Faculty Fellows Program. Diane Weltner Strommer is an accreditation adviser to international institutions of higher education in Europe and the Middle East. She is dean emerita of University College and Special Academic Programs at the University of Rhode Island. PART ONE: Understanding First-Year Students. Chapter 1: First-Year Students in Perspective. Chapter 2: Intellectual Development in College. PART TWO: Effective Instruction for First-Year Students. Chapter 4: Knowing, Understanding, Thinking, and Learning How to Learn: The Goals of First-Year Instruction. Chapter 5: Preparing a Syllabus and Meeting the First Class. Chapter 6: Presenting and Explaining. Chapter 7: Creating Involvement in the Classroom. Chapter 8: Encouraging Active Reading. Chapter 9: Supporting Active Study Practices. Chapter 10: Trying Transformed Teaching. Chapter 11: Evaluating Student Learning. PART THREE: Opportunities and Challenges in First-Year Instruction. Chapter 13: Creating Inclusion in First-Year Classrooms and Curricula. Chapter 14: Teaching Large Classes. Chapter 15: Sustaining Engagement Outside Class: Office Hours, Advising, and First-Year Seminars. Chapter 16: Strengthening Commitment to First-Year Instruction.